You already take pictures with your smartphone. Let your checks in on the action. Deposit a check directly into your eligible checking or savings account using the Wells Fargo Mobile app. 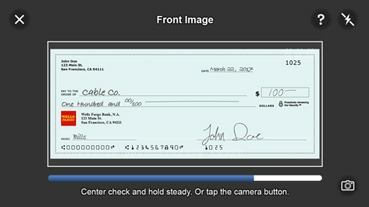 Take photos of the front and back of your check using our app. You’ll get immediate confirmation that the deposit was received. There are no additional banking fees for mobile deposits, so get clicking with your next deposit. Make deposits 24/7, almost everywhere you and your phone happen to be. Since mobile deposit is part of the Wells Fargo Mobile app, you already have it on your device. No additional downloads needed. Explore these simple steps to deposit checks in minutes. 1. Sign on to the Wells Fargo Mobile app. 2. From the menu, select Deposit Checks. 3. Read and accept the Terms and Conditions. 1. Choose which account you'd like to deposit the check to. If you have set up a default account, it will be pre-selected. If you want to create or change your default account, select the account from the Deposit to drop-down and check the box, Make selected account my default. 2. Enter the amount of your deposit. Your mobile deposit daily and monthly limits are shown above the Amount field. 1. Sign the back of your check and write “For Mobile Deposit at Wells Fargo Bank Only” below your signature (or if available, check the box that reads: “Check here if mobile deposit”). a. Place your check on a dark-colored, plain surface that’s well lit. b. Position your camera directly over the check (not at an angle). c. Fit all 4 corners in the guides of your mobile device’s camera screen. 3. The app will take the photo automatically, or you can select the camera icon to take the picture manually at any time. 1. Make sure your deposit amount is correct. 2. Check that photos are uploaded. 1. You’ll get a confirmation screen and email when your deposit has been received. 2. Write “Mobile Deposit” and the date on the check. 3. Hold on to it for at least 5 days, then destroy.